When it comes to determining search results, engines like to employ a wide range of programs and algorithms. When it comes to Google, everyone knows about Penguin and the main algorithms. at work. This is why we optimise keywords, develop strong links and create genuinely interesting content – as this all plays to what Google’s search engine understands. However, one of the more recent additions to this process is Google’s RankBrain, yet there are still many people who are not familiar with this. In short, RankBrain is a learning algorithm, designed to answer queries that it hasn’t previously come across. Launched in 2015, it’s purpose is to ensure the answers it delivers are more reliable. One of the ways it does this, for example, is by knowing when to use negative terms, such as “without” - things that Google might otherwise ignore. This is important, of course, because it greatly changes the results that get listed. Yet RankBrain is also a learning algorithm, which means that it is constantly improving and developing. This means that RankBrain can deliver better and better results. It is occasionally refreshed but, like many things behind the scenes at Google, any further knowledge of this isn’t disclosed. Should You Worry About It For SEO? 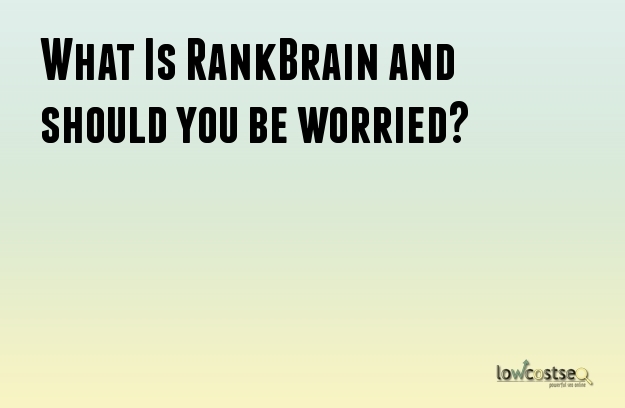 As an algorithm, RankBrain is an important factor for SEO, but it isn’t something you can play to in particular. RankBrain simply ensures the results are more satisfactory for the user, but this doesn’t mean it is likely to drop specific listings. Of course, for people with keywords in extremely rare niches – or those with negative terms – they may want to be quite thankful for RankBrain. Yet, on the other hand, the chances are these queries are often long-tail keywords, anyway. It also still only concerns results in Google – this includes both typical listings and PPC adverts.Any additional advertising elsewhere (such as social media) won’t influence its decisions. This year, RankBrain started to be used for a wider range of search queries, as compared to the 15% in 2015. This is because Google has become more confident with the algorithm, as it is proving more useful. Yet, again, for an SEO point of view, this is something that is hard to predict. A popular factor to this, at least among SEO Agencies, is that RankBrain can occasionally understand that two different search queries want the same thing. This allows it to use its data from a more popular search term to complete a less popular term. Of course, this only works when the queries are distinct enough to make this connection clear, so it’s not a way for websites to piggyback on to popular keywords through lower hanging, long-tail terms. However, the technology is certainly proving popular, so its something worth keeping an eye on in the future. For now, however, RankBrain provides a discrete yet notable improvement for Google’s users.